This is how Dylan Lauger, founder, owner and operator of Lauger Concrete of Sturgeon Bay, answers the question that everyone asks. Well-known for high quality, dependable, utilitarian flat work (that’s insider-speak for what we laypeople think of as concrete: gray sidewalks, gray driveways, gray garage floors), Lauger Concrete has boldly moved almost exclusively into the arena of artistic, creative concrete involving elaborate patterns, stains and textures. What happened to inspire the switch? “I started the company in 1998. We were really busy. It was a good way to make a living and for a lot of years that was enough. Then one day, I lost ambition. I was just plain bored, and I started experimenting.” Years later, with a lot of trial and error (the other major element, in addition to boredom, that he attributes to his success), Lauger has become known, seemingly overnight, as the premier creative concrete artisan of Door County. Boredom may have gotten the ball rolling, but in talking to Lauger it’s easy to see that curiosity, passion, and talent play a bigger role. Lauger is 31 years old and has a youthful enthusiasm and dedication to concrete that’s commendable and contagious; one can almost forget that we’re talking about cement. 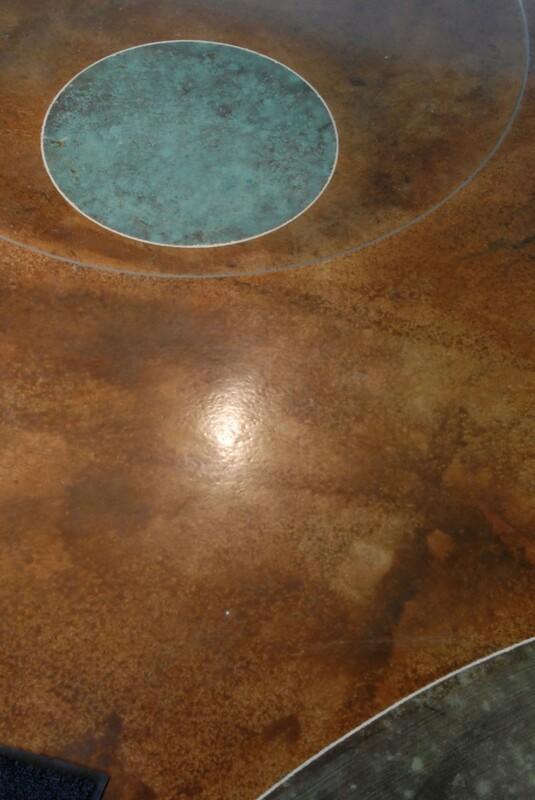 The concrete floor of the Blue Front Cafe in Sturgeon Bay. First, he explains the basics. Contrary to popular belief, concrete and cement are not the same thing; cement is actually just a part of concrete. Concrete is made up of three components: water, aggregate (rock, sand, or gravel) and cement. Cement (usually in powder form) acts as a binding agent when mixed with water and aggregates. This combination, or concrete mix, is poured and hardens into the durable material with which we are all familiar. Architecturally sound, concrete is a sure bet when you can’t afford to compromise durability for appearance, or opt for form over function. It’s also very flexible and fun, Lauger adds, and one of the best mediums for bold, creative artistic expression. The best part about it is that the artist is not bound to one form or one dimension. He grew up in Sturgeon Bay, watching and helping his father, who owned and operated Lauger Construction, a company that worked in all aspects of construction, including poured concrete. When Lauger was 15, his father died, leaving his mother with four children. After Lauger graduated from Sturgeon Bay High School, he dabbled in college for a bit, but soon returned to Sturgeon Bay to make a living doing what he knew best. What he didn’t know at the time was that he was learning to work with a material that would soon become his personal, artistic medium. 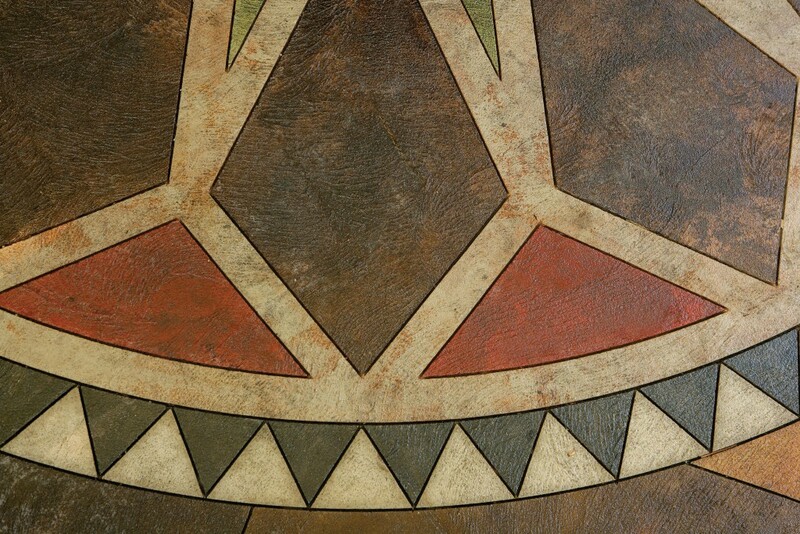 After just a few years in the business, he began using concrete like canvas. Lauger’s own home is a great example of his work. Located on an unassuming street near downtown Sturgeon Bay, he’s transformed a typical in-town lot into a multi-tiered, ethereal garden more likely to be found in a European urban environment. With rustic, acid-stained concrete blocks and a stacked-slab concrete waterfall, he’s carefully crafted the lighting and landscaping to best show off the architecture of the work. Goethe referred to architecture as “frozen music,” and when Lauger explains how he designed his garden, it’s very much like listening to a musician speak about the ever-evolving, imperfect art of composition. “I had an idea of how I wanted it to look and feel, but as I continued to work it kept changing. One color or pattern would lead to another and I’d come up with something else. I’d rip the first part out and start again.” Working and re-working his projects seems to be a common theme. “It’s a bad habit, this never being pleased. It would take me less time and money if I’d lower my standards,” he says. High standards are what keep Lauger in business. As much as he is an artist, he’s an entrepreneur as well, and concrete is his sole means of making money. When he sold his equipment to move fully into a more artistic end of the concrete business it was a definite risk, and initially his bottom line took a hit. “I still like to keep my hands on every project, so that when people call us, they get me. I think cloning would be a great idea; I could use about five of me,” he said. In addition to Dylan, his younger brother Luke Lauger is the only employee of the business, and is an integral part of making the business work. The brothers more than often work in tandem until a project is finished. The response to his work has been encouraging. Door County, in particular, is no stranger to the beauty of stone, rock and sand. We build our houses atop limestone bluffs and our villages on rocky shores and have watched for decades as Mother Nature has worked her magic on our peninsula, acid-staining much of our natural landscape. 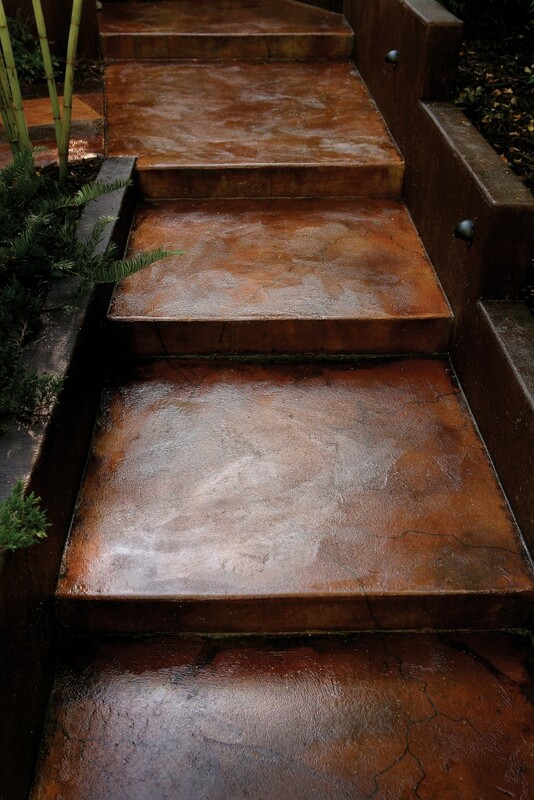 But when it comes to acid-staining within our homes, most customers want some control. 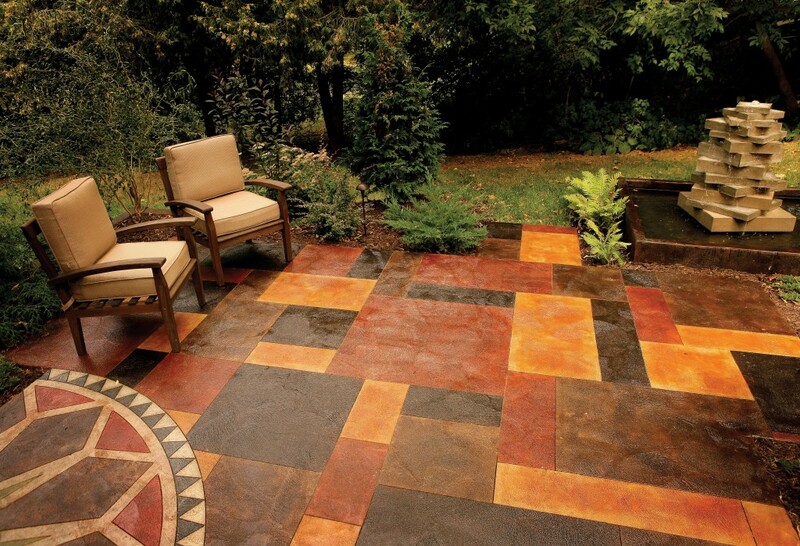 While the variegated and natural look of the end product is its most attractive feature, it can at first be daunting. Cathy Benjamin, owner of the building that houses her sister and brother-in-law’s Sturgeon Bay restaurant, the Bluefront Café, said that they discovered Lauger through a referral by their architect, Virge Temme. They showed Lauger the upholstery they had chosen for their booths, and asked him to design something compatible. What he came up with was a vibrant, intricate pattern of rich, copper tones and patina-like leaves and vines. The floor is stunning. 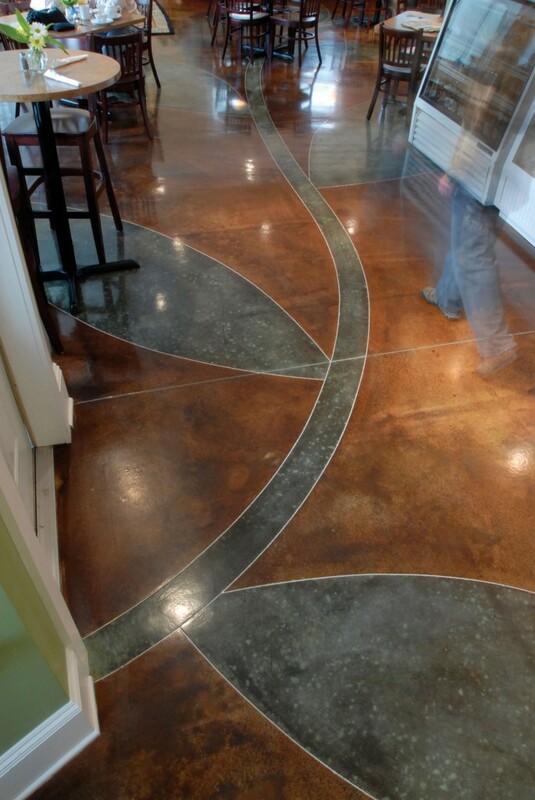 “When we remodeled, we had to completely rework the flooring – it was uneven and in very rough shape. We needed something durable and of commercial quality, but wanted something beautiful and original. We love it. It’s the first thing people notice,” says Benjamin. You can also see Lauger’s work at Café Launch on Third Avenue in Sturgeon Bay. Here, owner and operator Shannon Christenson opted for tabletops and a bar with a more neutral, textural look and feel. The smoothly polished, charcoal-colored pieces were designed and installed by Lauger. 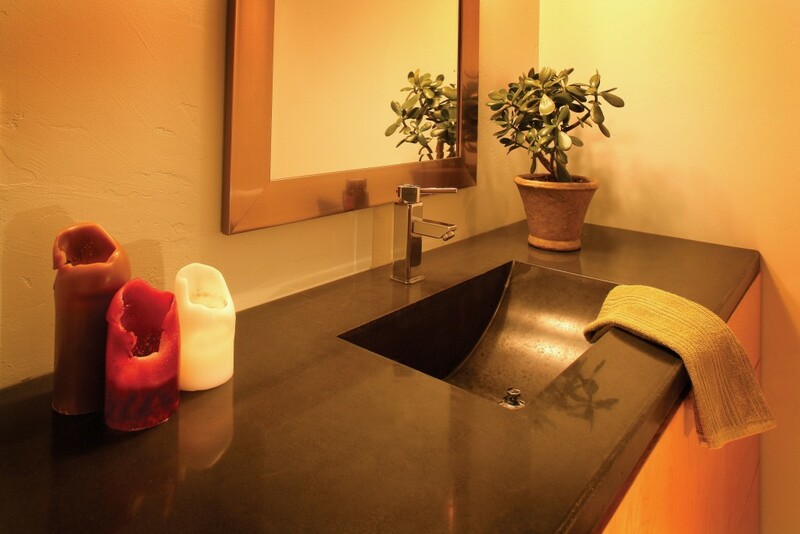 “I wanted something different than a laminate or wooden table top, and didn’t want the formality of granite. Concrete was a perfect choice. They are so understated that it’s surprising how many customers ask about them,” says Christenson. Merriam-Webster defines concretism as “the theory or practice of concrete poetry.” Much like a poet’s use of the written word, Lauger pays careful attention to the tone of his work, not just to how it looks but to how it makes people feel, using a myriad of colors, methods, textures and finishes to achieve his desired effect. “It’s a profession for me, certainly, but also a passion,” says Lauger. Spoken like a poet.